A couple of weeks ago, I attended a talk at my Brooklyn’s Book Court between Thomas Keller and Peter Kaminsky. Though technically about Keller’s latest cookbook, Ad Hoc at Home, it wasn’t strictly about food and cooking. From process and baseball analogies, he got to ritual and repetition and I realized what I’d been missing. Trying to post regularly, I’d become sharkish, cooking in constant motion. I’ve gotten used to being just a few clicks away from French-Italian-Regional-Seasonal-Indian-Mexican-Caribbean. It’s tempting to jump from one to the other, trying everything once then moving on. Having set out to write about traditional food in a new medium, I forget that the best part can be going back, trying again, and making it a little better. I had ritual, but my repetition was lacking. 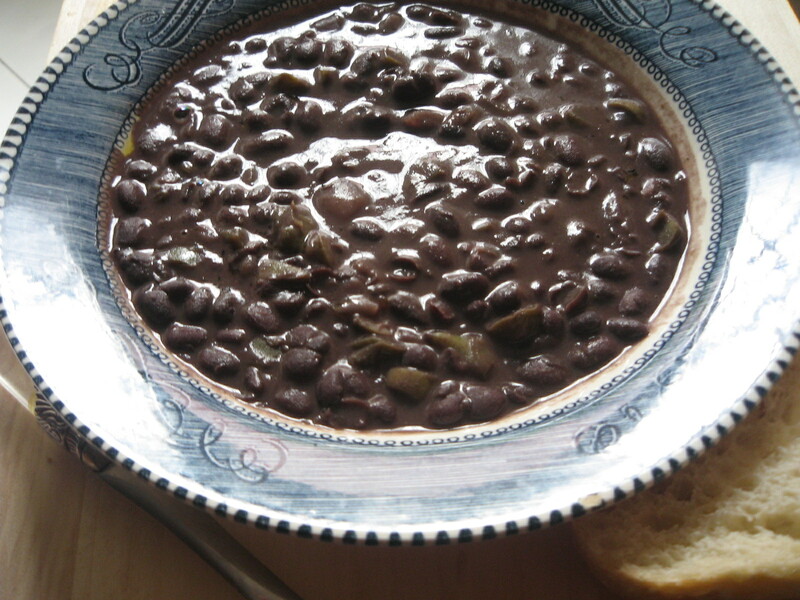 Looking back over my posts, the one dish that I’ve wanted to try again was frijoles negros. The first time I wrote about them, I was finding my way through my grandfather’s recipe. 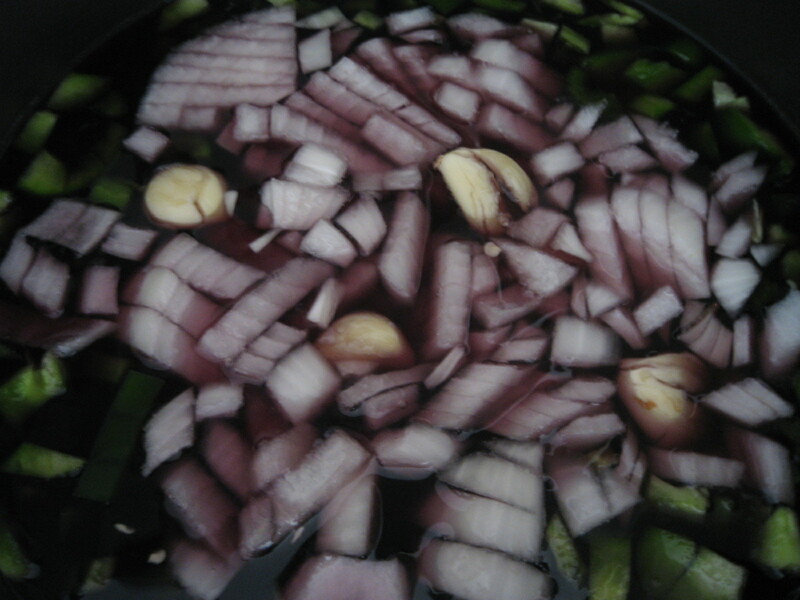 Not sure of where I was going, I focused on what came next – peppers, onions, bay leaf, simmer. Retracing my steps through the same recipe, there were no major changes just small surprises – the way the black beans, purple tinted white onions and green peppers form orchids in the pot, the whole mashed garlic cloves that disappear into the beans, the olives I’d forgotten to add. I was also more confident that I could correct mistakes. Over cook them and you only need to add more water, turning back the clock to the time before you decided to answer that email or pick-up your cell phones, they’re generous little beans. Easy to make well but hard to make great, this batch turned out better than the last. In a few days it’ll be gone. If I want to know more, it’s up to me to soak, chop, simmer, and repeat. Click here for the original post. I’ve revised the recipe in both locations to reflect minor adjustments. 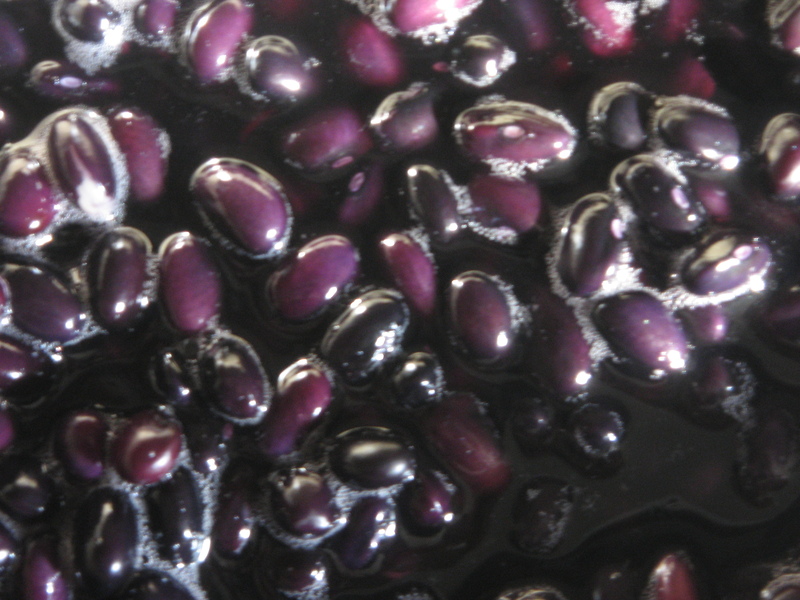 Soak the black beans overnight in a large pot with 10 cups of water. Add the next five ingredients to the beans and bring to a boil. Lower the heat to medium and simmer for 1 hour, check regularly and skim the foam that forms on the top. To make the sofrito, warm the remaining olive oil in a large skillet over medium heat. Add the remaining onion, green pepper and garlic and sauté for about 5 minutes till soft. Add the bay leaf, cumin, oregano, black pepper and salt and cook for about 2 minutes more. Off the heat, add the sugar. Serve as soup, over white rice or as a side dish to just about anything. I had a hankering for black beans the other day, but I put off making them because I obviously lacked the foresight to soak the beans (darn those sudden cravings!). Your recipe sounds like it will hit the spot. These frijoles look delicioso. All you need now is a big pile of white rice and you are good to go! That’s great to hear. I’m so happy it worked out! This is always debated. I make mine in the same soaking water which helps retain the color and some feel it makes for a thicker broth. Let me know how it works! What white wine is ideal for this recipe? Ideally, whatever wine you use to cook with you should also want to drink. I usually go to the wine store and ask them to recommend something good but inexpensive so I don’t regret pouring it into the beans. Thanks for the recipe, have the beans soaking now and will make tonight. Making veggie burritos for friends and plan to use your (your granddad’s) beans. Have a couple of questions on the olives. What is the unit of measure? The recipe says “1/4 green olives stuffed with pimentos, thinly sliced”, but doesn’t mention unit of measure. Also, don’t see where it says when to add the olives. Did I miss something? That’s supposed to be a 1/4 cup! Thank you for catching it and good luck with the beans! Thanks, when do I add the olives? THANK YOU! I just made these and am waiting for them to be done. Can’t wait! I am a W.A.S.P. originally from suburban Philadelphia so my cultural heritage is…well…nil! So I adopt the heritage of others based on my taste. Black beans are a favorite! I found you recipe on the NYT Cooking site which led me to your blog! Hooray! ps – I am also in the film biz and was a feature production coordinator (in Los Angeles) for 12 years! You go girl!